Our favorite boutique in the Bird Rock neighborhood of La Jolla moved up the street recently, so after a belated birthday lunch for Alexa at Beaumont's we strolled a few stores down and popped into Capricorn Boutique to see the new digs. The black built-ins, the gorgeous Jonathan Adler Nixon table, the string of butterflies hanging in the dressing room … it's all gorgeous. See our previous finds from Capricorn here and here. that shirt is awesome! love it! Swoon...I seriously want everything featured here - so many gorgeous finds!! Love the look of that shop! 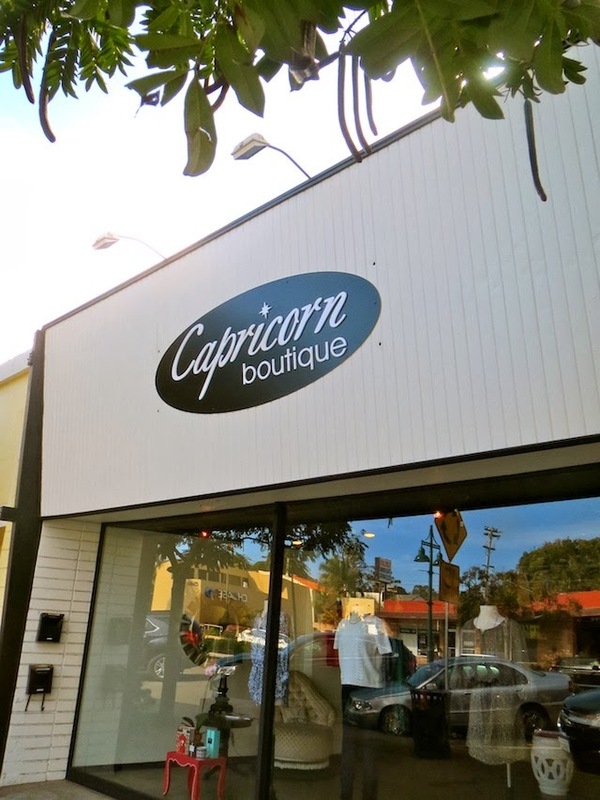 I always love a good local boutique, and it looks like there's some goodies in Capricorn! This boutique looks fantastic. I need that tshirt! Fun post! Oh my goodness! This shop is adorable! Local shops are the best! so cute! I bet you found a lot of goodies to lust over. I want to go shopping with you guys! SO CUTE!! I love Bird Rock! There were two of the cutest shops when I lived in SD but they both moved. Sad. Next time I'm in SD, I'll have to go to Capricorn!! Looks like a pleasant place to go shopping. Love how they styled the jewelry over the hanger! Love the t-shirt and other clothes/accessories spotted in the boutique. Very cool!